In most cases, heel pain is caused by repeated prolonged walking, running or jumping and wearing improper shoes. According to one source, the left heel is typically the first to be affected (37). Severe heel pain can be caused by a rupture of the Achilles tendon or plantar fascia, heel fracture and nerve entrapment. Blisters and corns are caused by constant pressure and rubbing by shoes. A blister is a minor skin damage with a localized fluid accumulation within the skin. Blisters on the bottom of the heels are usually painful and tender but they are not always visible. Corn (clavus, heloma) is a small (few millimeters) circular or conical skin thickening with a dark core (39). Do not try puncture a blister or cut corn on the bottom of the heel on your to avoid infection. A blister and corn can heal on its own but may not go away if the pressure continues. A custom heel insert with a hole at the site of pain, or debriding agents (salicylic acid, urea) can ease the healing and prevent pain (39). A podiatrist can remove persistent corns. 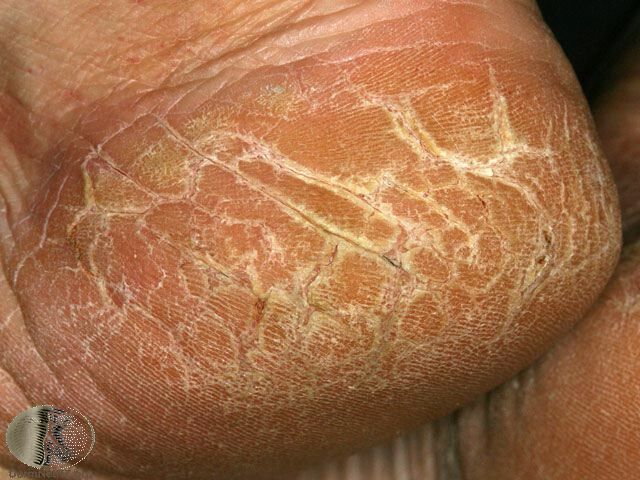 Symptoms include cracked, thick, yellowish skin (callus) with deep fissures around the rim of the heel (25). Risk factors include dry skin, atopic dermatitis, diabetes mellitus, psoriasis, plantar keratoderma, hypothyroidism, obesity, wearing open-back-shoes, prolonged standing or walking. You can get rid of cracked heels by using debriding agents, such as urea or salicylic acid. A bandage, moisturizing creams or wearing heel pads or cups can help fix the problem. Plantar fasciitis or fasciosis is an overuse injury of the plantar fascia–a band of the tissue that extends under the skin on the soles from the heel to the toes. Symptoms include dull intermittent pain and tenderness on the inner, front side of the bottom of one or both heels or in foot arcs; pain is worse after rest, for example, after prolonged sitting or in the morning after getting out of bed. Pain increases over the months and can be relieved by few minutes of walking. 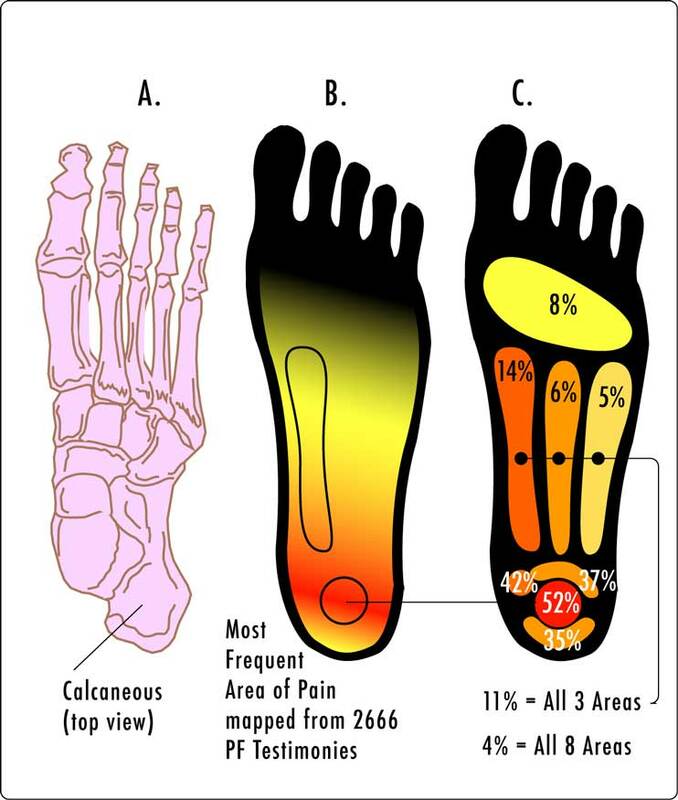 A typical sign is the pain triggered by upward flexion of the toes (24). 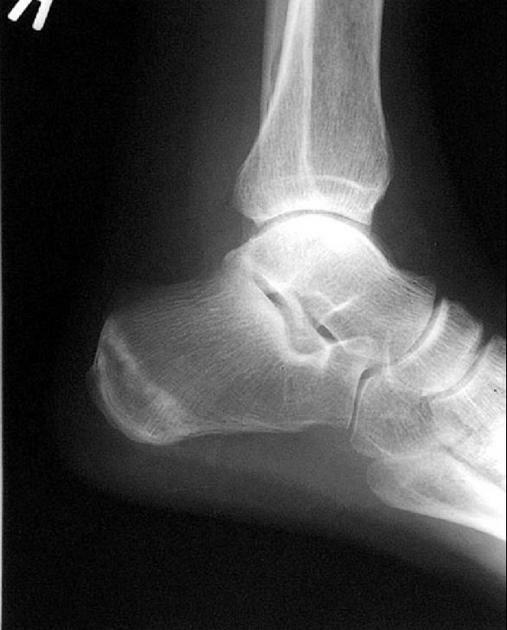 Risk factors include wearing shoes with elevated and tight toe boxes, high arched feet, excessive foot pronation (inward rotation), flat feet or other foot anomaly, tight Achilles tendons, certain sports (golf, cycling), truck driving, sedentary lifestyle, muscle weakness after cast removal, old age, diabetes, rheumatoid arthritis, psoriatic arthritis, reactive arthritis, ankylosing spondylitis and fibromyalgia (4,12). Triggers include prolonged standing, especially in overweight women after menopause or in pregnant women wearing unsupported footwear, prolonged repeated walking, running, jumping, walking upstairs or on tiptoes, pushing a heavy object and steroid injections. Diagnosis can include a physical examination and ultrasound. Massage with two fingers along the foot arc 3 times for 1 minute with 30 seconds rest in between before making first steps in the morning (43). Wear shoes with flat heels, high arc support insoles, wide toe boxes and flexible soles, making a hole in a shoe pad at the site of the tender spot. Avoid prolonged standing, walking and running or walking barefoot. Plantar heel spurs–the overgrowths of bone on the bottom of the heel–commonly develop in plantar fasciitis but only sometimes cause pain (8). If they do not cause pain they do not need to be removed. Surgical removal of a spur does not necessary relieve heel pain and can be associated with complications, such as bone infection or fracture (3,8). Symptoms and signs: sudden, sharp pain, tenderness, swelling or bruising on the inner side of the heel or foot arch; bruising can appear within few days. Treatment: a short-leg nonweight-bearing cast and crutches for 4-6 weeks; surgery is rarely needed. Plantar calcaneal bursitis is an inflammation of the fluid-filled sac on the bottom of the heel, which prevents friction between the heel bone and plantar fascia. When you repeatedly land with the heels on hard surfaces during running, you can bruise the fat pad under your heel bone, which causes pain, tenderness and swelling and, sometimes, bruising with visible discoloration (3). Treatment is similar as for plantar fasciitis. Prevention can include heel cups or donut-shaped cushions (15). A puncture wound can also cause heel bruise. Landing hard on the heel can cause bone bruise with blood accumulation in the heel bone and visible bruising of the soft tissues on the bottom of the heel. Diagnosis can be made by magnetic resonance imaging (MRI) (16). Treatment may include wearing a non-weight-bearing leg cast. Recovery time my be from several weeks to months (16). 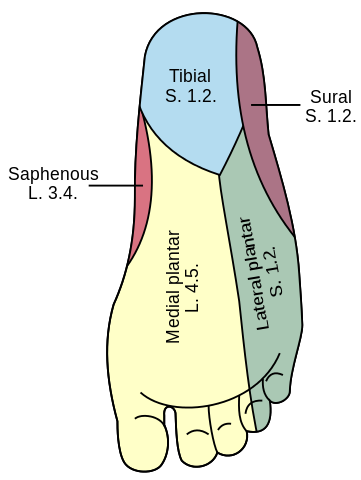 The first branch of the lateral plantar nerve (Baxter’s nerve) enables sensation in the front of the heel. Stable fractures without bone displacement need only non-weight bearing casting. The recovery time, during which you may not be able to put weight on the heel, is at least 6-8 weeks. Unstable fractures with displaced bony parts require surgery; recovery time may be from few weeks to 1-2 years. Physiotherapy can help to restore the mobility of the foot. A stress fracture is a small “hairline” fracture within the bone in which the bone as a whole does not fall apart. Peripheral neuropathy means damage of the peripheral nerves. Causes include diabetes mellitus, alcoholism, vitamin deficiencies, peripheral artery disease and injury. Symptoms usually develop slowly in the symmetrical “stockings and gloves” pattern and may include stabbing pain, paresthesia (tingling, burning, extreme sensitivity or numbness) in the soles of the feet and weakness in arms and legs . Bone cyst in the heel rarely causes pain. Neuroma–a benign tumor of the medial calcaneal nerve can present with a painful lump on the bottom of the heel (24). Primary bone cancer (Ewing sarcoma), leukemia (40) or metastatic cancers in the heel are rare (24). 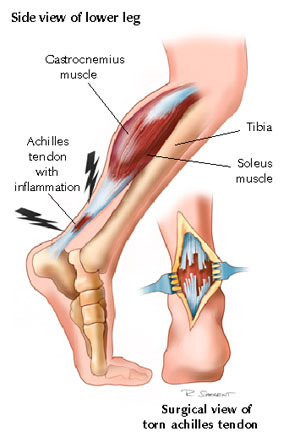 Achilles tendinitis is an inflammation of the Achilles tendon, which connects the calf muscles to the heel bone. Symptoms include pain on the back and above the heel, which can be present in the morning, can improve with mild exercise but worsen with continued exercise and by the pressure of shoes (5,27). In truck drivers, the right foot is more commonly affected. Signs include swelling and warmth on the back of the heel, tenderness and intense pain upon squeezing the tendon from the sides during moving the foot upwards and downwards (24,27). Causes include jumping (basketball, volleyball), cycling, poorly fitting shoes, constant pressure on the accelerator pedal in truck drivers, overpronation (inward foot rotation) (26), ankylosing spondylitis, reactive arthritis, rheumatoid arthritis and gout. Diagnosis is by a physical examination; MRI can reveal the extension of the damage. Treatment can include rest from hard exercise, ice packs, immobilization, night splints, oral painkillers, wearing open-back shoes, heel lifts or cups; massage and stretching exercise after the pain goes away and ultrasound therapy (27,28). Steroid injections are not recommended because of the risk of tendon rupture (5). In severe cases, surgical removal of the abnormal tissue may be needed. 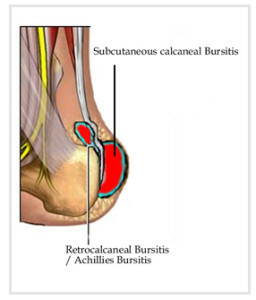 Retrocalcaneal bursitis is an inflammation of a fluid-filled sac–bursa–that lies between the heel bone and the Achilles tendon (3). A posterior heel spur is a bone overgrowth on the back of the heel bone. 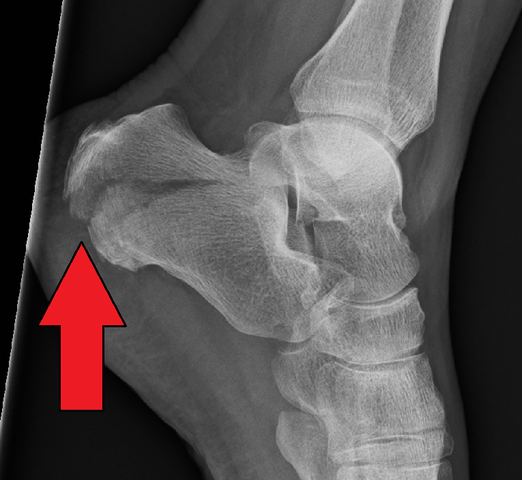 Diagnosis: X-ray can show a bony spur near the Achilles tendon. 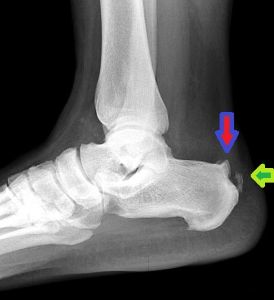 Calcaneal apophysitis refers to irritation of the center of the heel bone due to athletic activity, obesity or poorly fitting shoes, mostly in boys 6-14 years of age (4,9). Arthritis is a rare cause of chronic heel pain. Rheumatoid arthritis symptoms include symmetrical joint pain and stiffness in fingers, toes, knees or other joints, subcutaneous nodules on the soles and bunions (bunny bumps at the bases of the big toes) (23). Psoriatic arthritis symptoms: scaly skin and pain in the shoulder, elbow, hip, fingers, knee and on the back of the heels on one or both sides (22). Reactive arthritis or Reiter’s disease symptoms in young men: symmetrical pain in the knees, ankles and on the back of the heels, inflamed eyes and burning urination (21). Gout symptoms: sudden, severe painful attack in the big toe, which is usually red, hot and swollen; other possible painful spots: heel, ankle, knee, wrist, usually only on one side (20). 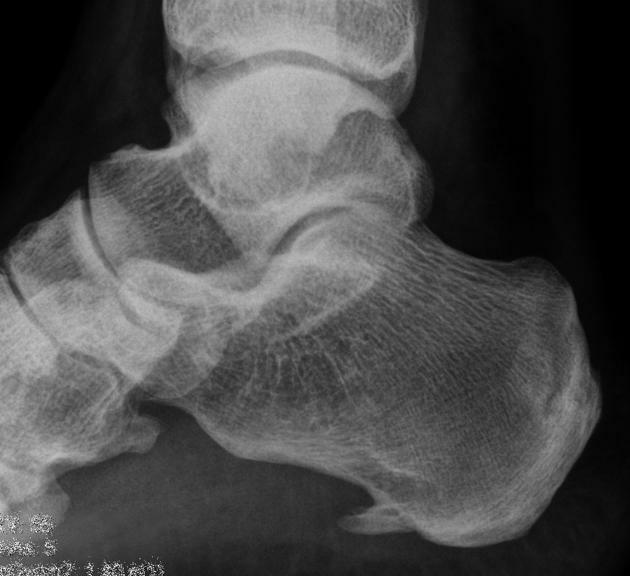 Overload heel pain syndrome with or without heel pad atrophy in older or obese individuals includes diffuse pain limited to the bottom of the heel; upward flexion of the toes does not trigger pain (24,44). Repeated steroid injections can also result in heel pad atrophy. Losing weight, avoiding prolonged standing and wearing soft shoe pads can help prevent pain. Paget’s disease is a chronic disease with abnormal bone remodeling. Symptoms include pain and tingling in the heel but usually no tenderness. Diagnosis is by MRI. Treatment may include painkillers, bisphosphonates or surgery (34,35). Women who wear high heels, pump shoes, sandals or other footwear without firm structure are more likely to have heel and knee pain later in life (7). Sciatica is pain caused by compression of the L5-S1 spinal nerve root, usually due to a bulging or herniated disc. Symptoms may include pain, tingling or numbness in the lower back, buttock, back of the thigh, in the calf, outer side of the heel and foot and in the pinky and 4th toe, usually only on one side. Pain is often aggravated by sitting and relieved by walking (9). Signs: tenderness on the outer side of the foot below and in front of the ankle; upward flexion of the toes triggers pain behind/below the outer ankle. Tarsal tunnel syndrome is caused by the compression of the posterior tibial nerve on its course behind the inner ankle. Symptoms include pain, burning, tingling or numbness below the inner ankle and on the inner side of the bottom of the foot. Tinel’s sign. Tapping behind the ankle can trigger pain that radiates toward the toes. Pushing the toes up triggers pain behind the inner ankle. The bottom of the heel is usually not tender. Causes include previous ankle fracture or inflammation of muscle tendons; pain can be triggered by standing or walking after prolonged period of rest. Therapy can include correction of eventual excessive pronation, physical therapy or surgical decompression. 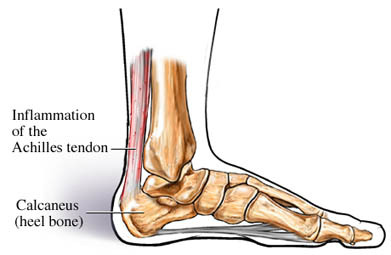 Posterior tibial tendonitis is inflammation of the muscle tendons that run behind and below the inner ankle. It can cause tenderness below and behind the inner ankle and in the middle of the inner side of the foot (24). 1. Rest from the activities that cause pain. 2. Ice packs wrapped in a towel for 20 minutes several times a day can reduce pain and inflammation. 3. Oral painkillers, usually non-steroidal anti-inflammatory drugs (NSAIDs), such as aspirin, ibuprofen or naproxen. 6. There is insufficient evidence of the effectiveness of acupuncture and botulinum toxin injections in the treatment of heel pain. Calf-stretching exercises strengthen the Achilles tendon and can help prevent pain in plantar fasciitis, Achilles tendonitis and in plantar and retrocalcaneal bursitis. Stand 40 cm away from the wall with one foot in front of other and with hands on the wall and lean forward while having the front leg bent at the knee and the back leg straight. Hold for 10 seconds and repeat 10 times with each leg every day for 6-8 weeks. Sit on the floor with your legs straight forward. Loop a towel around the ball of the foot and pull it toward you and hold for few seconds. Repeat 10 times with each foot several times a day. Stand on the bottom step of the stairs with only toes, lower your heels and hold for 30 seconds; repeat 10 times during the day. Roll your foot over a rounded can back and forth for few minutes before going to bed in the evening and before making the first steps in the morning. I have this burning sensation on the outside of my left heel,it hurts just laying in bed,I don’t have to be standing on it.It almost feels like someone giving you an electric shock or someone driving a nail into it .Very bothersome. I do wear orthits for plantar fascists but for some reason it dosen’t do much for this issue.Can some tell me if they have experienced this problem and if so what did you do for treatment. I experience extreme burning around the rim of my heels in bed at night. Cannot stand to have the rim of my heels touch the bed sheets, so I sleep with a pillow under my ankles, so my heels are not touching the bed. Most of time that solves the problem, but at times I will have several nights in a row where the rims of my heels are literally on fire to the point of agony and being unable to sleep. What could cause this? You can ask in your club for a sport doctor or you can just go to your primary doctor who can make a physical examination and give you more reliable answer than I can from here.